My sixteenth stadium of 2013 was on Tuesday 23rd July 2013 at the Wallace Binder Stadium in Maldon, Essex. 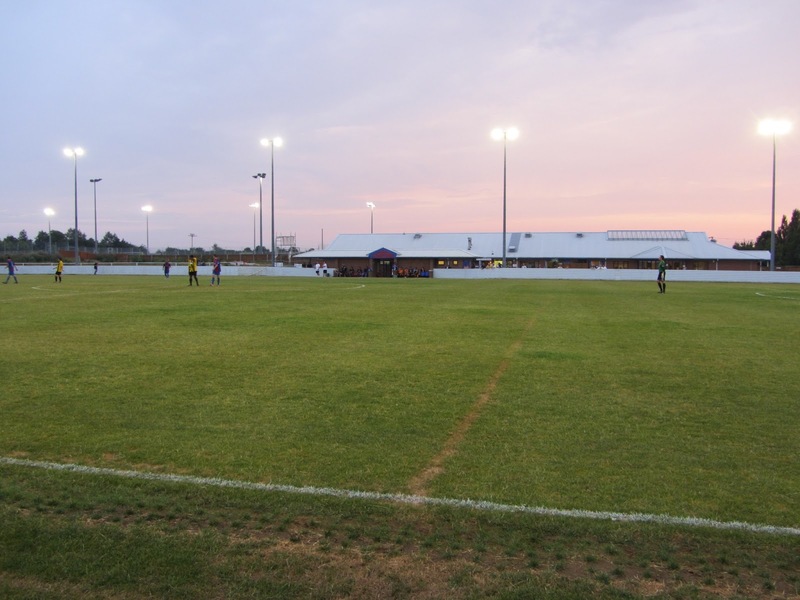 The match was Maldon & Tiptree vs. Enfield 1893 in a friendly game. 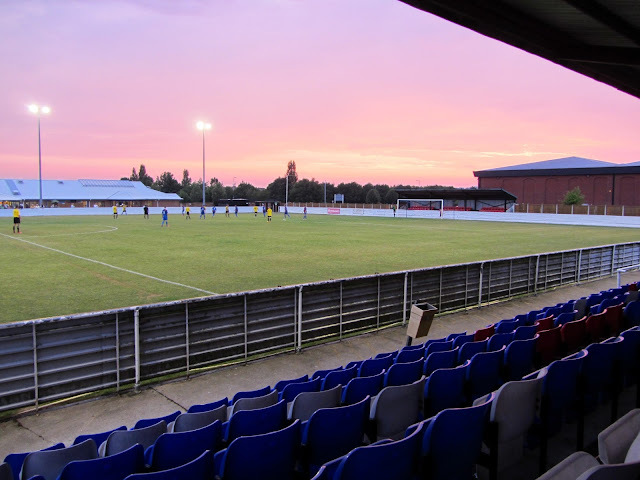 The Wallace Binder Stadium sits on the south-east corner of the town of Maldon. The nearest railway station is Hatfield Peverel, around 6 miles to the north-west of the ground. 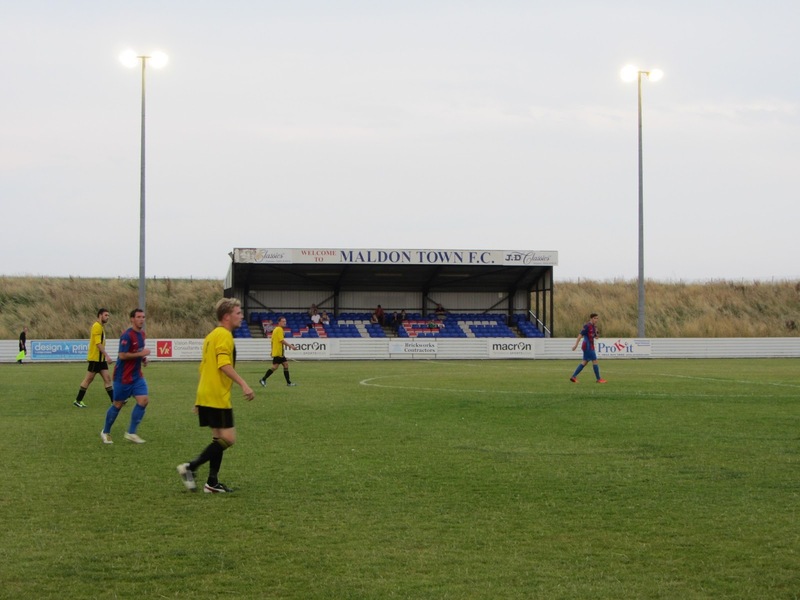 Maldon Town moved into the venue in 1994 and when they merged with Tiptree United in 2010 it became home of Maldon & Tiptree FC. The ground has two all-seater stands - one which is level with the half-way line on the eastern side of the ground and one which sits behind the goal at the northern end. The East Stand is the larger of the two and is able to seat 250 fans. There is a grass bank which runs the length of the east side of the ground but it was rather overgrown on my visit and not a place to watch the game from. The smaller stand behind the northern goal has 93 seats contained within it. Neither of these stands have any supporting pillars to restrict views. The west side of the stadium has the clubhouse, dressing rooms and dugouts as well as some picnic benches. The main building also hosts community activities during games with fitness and singing groups using it while the match was taking place. The game was a friendly match between Isthmian League Division One North side Maldon & Tiptree and Essex Senior League side Enfield 1893. The match started tentatively with little action in the first 20 minutes. After this the home side started passing the ball well around the Enfield box and when they hit the post in the 26th minute it only looked a matter of time until they opened the scoring. 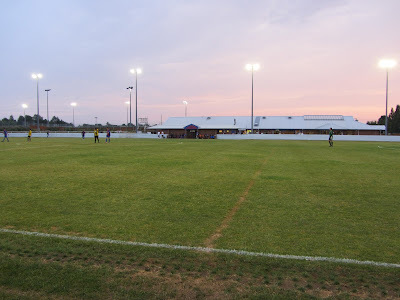 However, it was the visitors who netted first when, against the run of play, they dispossessed Maldon in the midfield and a through ball was played to the Enfield striker who ran into the area and slotted past the keeper. A few minutes later the visitors doubled their lead with a free-kick from the far side of the box - with everyone expecting a cross the free-kick taker instead drilled the ball into the corner of the near post leaving the keeper stranded. The home side were defensively chaotic during this period and Enfield could have had a couple more from set pieces before the break. The second half was a completely different story though with Maldon showing their class. In the 52nd minute they pulled a goal back when their winger rode several weak tackles before flashing a great shot across goal into the side of the net. 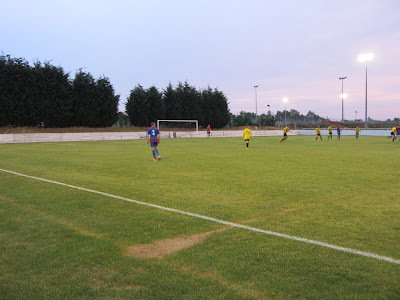 5 minutes later the equaliser came from the penalty spot after a trip in the box and in the 67th minute a terrific curling effort from the edge of the 18-yard-box saw the comeback completed as the home side took a 3-2 lead. A couple of minutes later they should have extended their lead when a striker rounded the keeper only to shoot wide. It finished 3-2 to Maldon and after a very good second half performance this was a deserved victory.